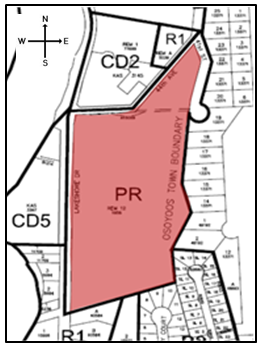 The following bylaw amendments will enable comprehensive development of the property located at 4217 Lakeshore Drive (see map below) for mixed housing along with a small amount of commercial space. OCP Bylaw Amendment No. 1230.16, 2016 to change the Land Use Designation from Tourist Commercial - TC to Comprehensive Development - CD. Zoning Bylaw Amendment No. 1085.96, 2016 (AS AMENDED) to create CD9 – Comprehensive Development Zone. All persons will be given an opportunity to be heard and/or present written submissions on the matter above. Written submissions can be mailed to the undersigned or emailed to info@osoyoos.ca (The Town will only guarantee that emails received to this address will form part of the Council Agenda). The deadline for written submissions is 12:00 pm (Noon) Friday, March 17, 2017. Copies of the proposed OCP and Zoning bylaw amendments can be viewed by clicking on the links above or at the Planning and Development Services office, located at 8711 Main Street from 8:00 am to 4:00 pm, excluding lunch hours from 12:00 pm to 1:00 pm and excluding Saturdays and Sundays. OCP Bylaw Amendment No. 1230.16, 2016 to change the Land Use Designation from Tourist Commercial to Comprehensive Development. Zoning Bylaw Amendment No. 1085.96, 2016 to create CD9 – Comprehensive Development Zone. The development proposal is to build between 234 – 274 residential units over 7 phases, including a mix of ground-entry housing types and depending upon the market, two 4-storey apartment buildings at the lower end of the property with some possible commercial space. About 60% of residential units would be available for tourist rentals. A public park would be dedicated in the area of the existing ponds on the subject property. OCP Bylaw Amendment No. 1230.19, 2017 to replace our current Regional Context Statement. The Board of the Regional District of Okanagan-Similkameen (RDOS) has approved an amended version of the South Okanagan Regional Growth Strategy (RGS), which necessitates, in turn, that the Town of Osoyoos amend the Regional Context Statement (RCS) in our OCP showing how we support the RGS. Council gave first and second readings to the following bylaw amendment on February 6, 2017. All persons will be given an opportunity to be heard and/or present written submissions on the matters above. Written submissions can be mailed to the undersigned or emailed to info@osoyoos.ca (The Town will only guarantee that emails received to this address will form part of the Council Agenda). The deadline for written submissions is 12:00 pm (Noon) Friday, February 17, 2017.